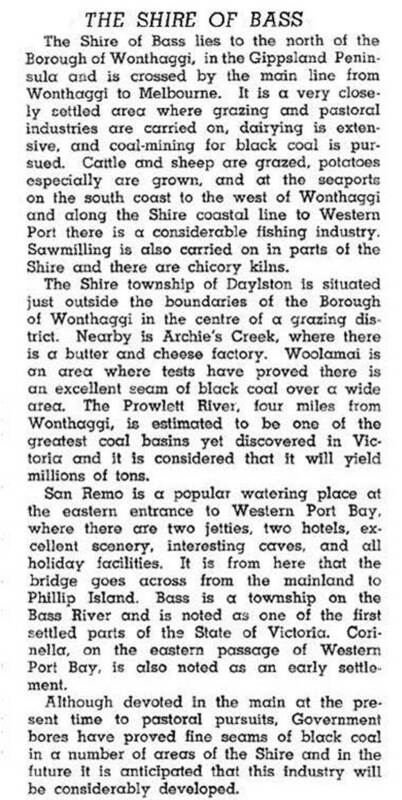 Bass Shire (1929-94) was south-east of Melbourne, facing the east side of Western Port Bay. Its area extended into Gippsland as far as Loch, Kongwak and Wonthaggi. Its coastal towns included Grantville, San Remo and Kilcunda. The shire was proclaimed in 1871 as 'Phillip Island and Woolamai', with an area of 669 square kilometres. Phillip Island was severed in 1928 and the reduced shire was named Bass in 1929. The name arose from the maritime exploration by George Bass (1771-1803) in 1797-98. Bass entered Western Port Bay by the entrance between Phillip Island and San Remo, and named the island's southern cape 'Woolamai'. Going further, Bass found a freshwater river on the eastern side of the bay, today's Bass River. Subsequent British and French explorers surveyed the bay in 1802 and Tasmanian settlers, the Andersons, formed Victoria's third permanent white settlement (after Portland and Port Phillip) on and in the vicinity of Bass River. The shire's European settlements were along the coastline, usually only a few years before school openings: Bass (1866), Grantville (1872) and Kilcunda (1880). The Bass Valley consolidated school at Corinella now serves these localities. All had churches and halls. Almurta's hall fell into discard, the others continue. Kernot's church is a Presbyterian memorial building constructed in 1956. Population growth in the shire was marked up to the 1920s. From the early postwar years populations were static, declined in the 1970s, and rose in the 1980s as coastal living developed. There was no particularly dominant town. The shire's headquarters was at various places: Cowes (1872-76); San Remo (1876-1913); Dalyston, Kilcunda, Bass, Cowes (1913-23); Dalyston (1923-c1980); Archies Creek (c1980-94). In 1994 Bass Shire had 42,600 meat cattle, 24,000 dairy cattle and 22,300 sheep and lambs. Farming occupied 80% of the shire's 526 square kilometres.